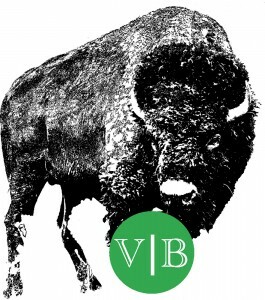 On Labor Day 2014, BreadHive held a grand opening for their ordering window and naturally Vegetarian Buffalo had to be there! That sounds homey and cozy, right? Right. So it’s only fair to check this place out. 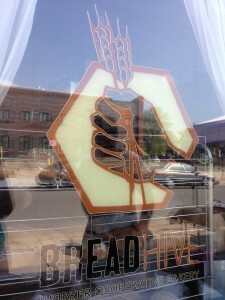 Breadhive had their window opening celebration on Labor Day which was a beautiful event. There were event tents, chairs behind the building for mingling and socializing, and a table for cutting and fixing up your order the way you like it. My husband and I stepped up to the window and each ordered The Combo which is a Bagel, First Light chèvre spread, and a Public Espresso coffee. 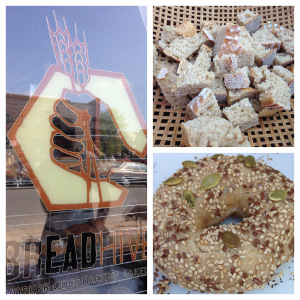 We were given the choice of what bagel, so I went for the recommended 3 Seed bagel that had flax, sesame, and pumpkin seeds baked right on top and my husband went for plain. The coffee could either be hot or iced, so we decided on iced since it was a beautiful day and we were headed to the Eternal Flame at Chestnut Ridge. The special price for the day was $3 for The Combo, but normally The Combo is going to be $4.25. It should be mentioned, they don’t like to swipe credit cards for less than $10 (which I totally understand), so either bring cash or expect to purchase a few things that will ring up over Alexander Hamilton. On the aforementioned table there was a bagel splitter with plates and knives set out for customers to situate their bagels, so my husband and I got our bagels slathered up with chèvre cheese (which if you were like us and didn’t know what animal chèvre is from, it’s goat. Straight-up, pungent, delicious goat cheese directly from First Light Farm and Creamery). My husband took our cups to the Public Espresso + Coffee tent and was poured cold brewed coffee over ice while I finished snapping pictures. Half and half and simple syrup were laid out so we could make our iced coffee the way we like it, which was fantastic because given the chance I don’t like to sweeten my coffee too much. On that note, Public Espresso has amazing coffee, which is fantastic because this means I can just go over to Breadhive’s window to pick up some food and coffee during their available hours! 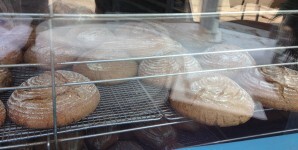 The bagels were amazing. They weren’t too large, but dense and delicious. Their bagels tasted like I wished my homemade bagels would taste: real and fresh. I loved my bagel, however my husband who tends to gag at goat cheese couldn’t manage to eat his…so I ate his plain bagel too. #sorrynotsorry. By the way, it was anything but plain. It was delicious, fresh, and smothered in chèvre. 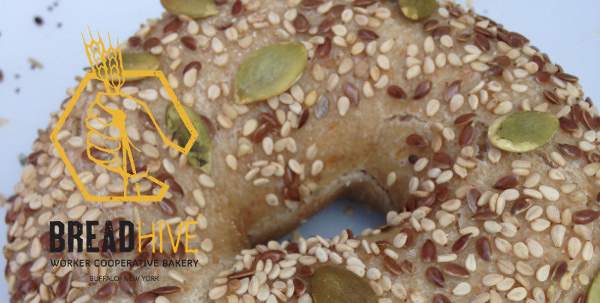 It’s not a stereotypical white flour bagel, but made with well-ground whole wheat until the texture is consistent like a plain bagel, but you can feel good about it.